Teams run through up to 10 inches of new snow Saturday, March 3, 2012 at the start of the Can Am Crown International sled dog races in Fort Kent. CAC 250 winner Ryan Anderson arrived in Fort Kent at 8:10 Monday morning. Minnesota musher Ryan Anderson spends some time with his dogs after winning the 2012 Can Am Crown 250-mile sled dog race Monday, March 5, 2012. "These dogs are looking super," Anderson said after crossing the finish line at 8:10 that morning, minutes ahead of second place finisher Mario Racine of Quebec. FORT KENT, Maine — Quebec musher Mario Racine held onto his lead in the Can Am Crown 250 for 230 miles until Ryan Anderson overtook his team on the final leg between Allagash and Fort Kent. Anderson went on to claim his first Can Am Crown win and bragging rights as the only musher to capture back-to-back UP-200 and Can Am Crown wins in the same year. The UP 200, run by the Upper Peninsula Sled Dog Association, is considered one of the top mid-distance races in the Midwest, covering 240 miles in northern Michigan. That race takes place in February. In the Can Am, Anderson covered the 250 miles of trail in 31 hours, 22 minutes and 16 seconds — less than a minute ahead of Racine. Fifteen mushers took off from Fort Kent at the race’s start Saturday morning in a snowstorm that ultimately dumped 10 inches of fresh snow on a trail that had more than 2 feet of snow deposited on it the previous week. Fellow Minnesotan Rita Wehseler passed four-time Can Am Crown 250 winner Martin Massicotte of Quebec within the final 10 miles of the race to claim third position, crossing the finish line at 10:06 a.m. Right behind her in fourth was Laura Daugereau of Kingston, Wash.
Massicotte arrived in Fort Kent at 10:42 a.m. The colder it is, the happier the dogs are, so Anderson took some time to assure his team was on the trail after the sun and daytime temperatures went down. While it was the best choice for his dogs, those extra minutes of rest could have cost him the race, given the close finish with Racine. Anderson was confident he could make up any time to catch his nearest competitor, but he also knew there was tough competition out on the trails between Fort Kent and Allagash. This year’s field of mushers included past Can Am 250 winners Martin Massicotte and Bruce Langmaid and top finishers Andre Longchamps, Rita Wehseler and Ward Wallin. After taking his mandatory five-hour layover at Allagash, Anderson headed down the final 43 miles of trail to the finish at 3:15 a.m. Monday and 20 miles later saw Racine’s headlamp. Anderson passed the Quebec musher and five miles later lost sight of him. “He stayed with me for a while but I was able to pull away slowly,” he said. “My dogs did good — really, really good. What makes the victory a bit sweeter is the fact nine of the Can Am dogs were on his winning UP 200 team. Despite giving up his lead with just over 20 miles to go, Racine was all smiles at the finish. “I am very happy with my run and my dogs are all in good shape,” Racine said. On hand at the finish was Can Am chief veterinarian Nick Pesut, who was very pleased by what he saw. All Can Am 250 mushers started on Saturday with 12 dogs each, and by Monday only Al Hardman of Ludington, Mich., still had a full team. Local favorite Larry Murphy, who is retiring from racing after this year’s Can Am, was about two miles out of Allagash on Monday afternoon, where he will take at least a five-hour layover. He is expected in Fort Kent around 1:30 a.m. Tuesday. 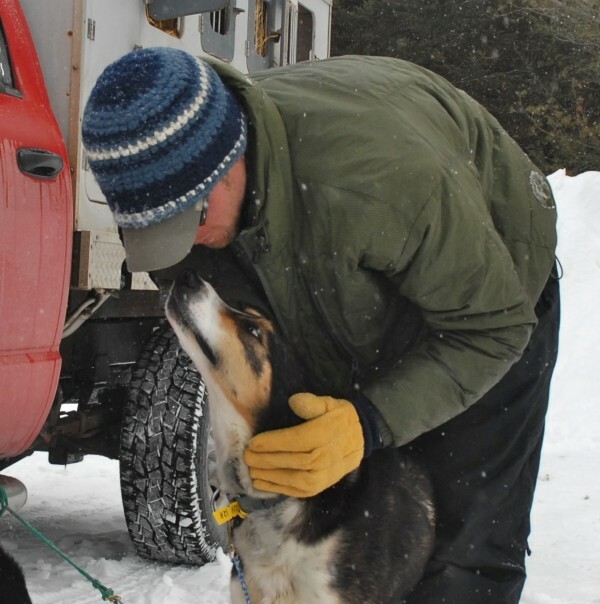 Among the other mushers, 31 dogs overall had been dropped from the race between Portage and Allagash. Race marshal George Theriault said the Can Am continues to enjoy a solid reputation among mushers in North America. “People like this race and it will continue to have a good reputation for many years,” he said.